Super League and the southern hemisphere National Rugby League have expanded the annual World Club Challenge to six teams for 2015. Apart from in 1997, when all 22 clubs involved in the two competitions took part, the event has been contested by the winners of both Grand Finals. Under the new format, the two league systems each field three participants. Super League's finalists and third-highest ranked team will join the NRL winners plus South Sydney and Brisbane. Should one of the two confirmed entrants win the NRL, a third team will be invited. Both organisations have agreed to play across the weekend of Friday, 20 February to Sunday, 22 February. Since the competition - which began unofficially in 1976 - was revived after a three-year absence in 2000, the competition has become one of the major fixtures on the rugby league calendar. The 2015 event will also return to the northern hemisphere, following the Sydney final between the Roosters and Wigan Warriors earlier this year. Of the 22 finals, only four have taken place away from the UK - three in Australia and one in New Zealand. Warriors skipper Sean O'Loughlin played in the final defeat by Roosters, his second taste of the competition after the 2011 loss to St George-Illawarra. "Having played in a couple of World Club Challenge games during my career I know just how good it is to test ourselves against the best club sides from the NRL," O'Loughlin said. "The new expanded competition looks very exciting and we can't wait to be a part of it." 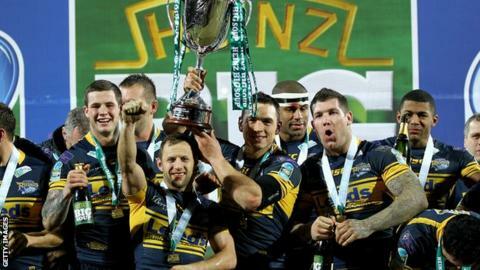 Leeds and Wigan have featured in six Challenge finals apiece, the most of all clubs to have taken part. The schedule, venues and ticketing are yet to be confirmed.